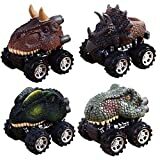 The dinosaur fun section of this web site includes a wide variety of toys and games including action figures, baby stuff, bath toys, board games, excavation, jigsaws, Lego, and models. 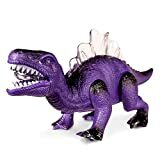 This purple & black Light Up Dinosaur Walker is mammoth fun at a prehistoric price. 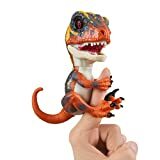 At 12" in length and 6" tall, this walking, roaring dinosaur toy for boys and girls moves, makes sounds and lights up. Powered by (3) AA included batteries, a simple toggle of the on/off switch has primitive predator on the move. Its lifelike jaws open to roar and its eye and tongue flash red. With each step forward, the spikey plates down the back light up and flash red, green and blue as it ferociously warns of attack. Perfect for dinosaur lovers ages 3+, this light up walking toy makes a megasaurus birthday or holiday gift, and is an entertaining addition to a classroom or playroom. Get this dynamic Light Up Dinosaur Walker before it goes extinct! Let's take a tour into another world - through the Jurassic and Cretaceous period exploring the colors, landscapes, and habitats of your favorite dinosaurs. With a sound book included you can now learn the rumbling sounds of each of the dinosaurs listed above. Just follow the narrating dragonfly as he leads you the prehistoric terrain filled with creatures roaming the earth! No need to worry about safety as this is made from Phthalate Free, Non-Toxic Plastic. Just head on up and add to cart! Make sure to send us your images and videos, we want to see them! 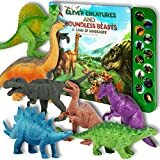 WHAT'S INSIDE: Each Boley Dinosaur Set includes 12 unique and intricately-crafted dinosaurs with vibrant colors and rich textures. 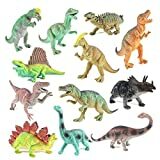 Made from high-quality, 100% child-friendly non-toxic plastic, these Jurassic dinosaurs will spark hours of creative and imaginative play as your children play with legendary creatures from prehistoric times! These dinosaurs are just right for a history exhibit or science project. Boley's beloved dinosaurs come with names stamped in the belly of the dinosaur. CHILD FRIENDLY & ALWAYS SAFE: As a global toy company, Boley's #1 priority is child safety. All of our toys are always 100% nontoxic, adhere to strict US and ASTM standards for child safety, and are rigorously tested and certified by independent third party labs for quality control and assurance. Boley supports and complies with the strictest of manufacturing standards established by ASTM, SCAN, BSCI, SMETA, Sedex, ICTI Care, and more. Please note this particular toy is designed for children ages 3 and up. LOOKING FOR MORE? Boley offers a diverse variety of kids' toys on Amazon. From play kitchen sets with food, pretend play cash register sets, toy banking sets with play money, dollhouses, race cars and toy trucks, fun bath toys, construction sets, legendary dinosaur sets, and other learning lootboxes, Boley has you covered! Simply search "Boley" or click on our store name to find the hundreds of educational and action-packed toys we offer to bring life, love, and laughter to families everywhere! My name is Blaze and I've got a HOT temper! 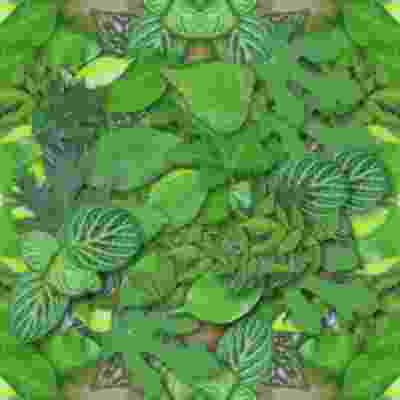 Meet the Fingerlings Untamed Velociraptors! These finger-gripping creatures are fierce and unpredictable, and know friends vs. foes. In untamed mode, they roar, hiss and chomp! In tame mode they nuzzle, purr and love to be near you. Complete with snapping jaws and gripping claws, these interactive dinos react to touch, motion, and sound with over 40 different sounds and animations. 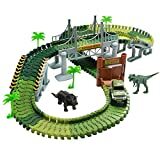 1.Dinosaur world car track set, there are 142 track pieces, very easy to assemble for boys kids toddlers. 2.Most kids like truck and car toys, This car track set is helpful to develop children's body coordination and practical ability. 3.The race track toy can entertain kids for hours, Help kids keep away from TV, iPad, computer, video game etc. 4.The toy is made of non-toxic plastic material and we comply with EU relative regulations. Good quality, environmental and absolutely safe toy for kids. 5.Ideal STEM educational funny birthday gift/present for kids and toddlers boys. 4 Toys with each about 7*5*6 cm & 45g, portable and suits for kids' little hand. As a powerful but extinct species, dinosaurs are always a great attraction to kids. 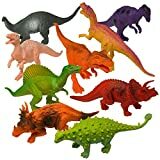 Therefore, dinosaur toys are always keeping their popular status among all the toys. Simple and interesting to kids, pull back cars can move automatically without any electric energy loss, and the big wheels makes it more durable. It's also good for interactive games. 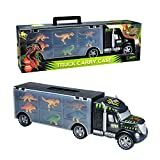 A + B + C = Pawaca Pull Back Dinosaur Cars = The Right Gift for Kids!! Super Value. 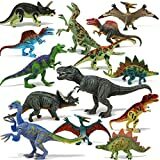 Includes 14 Pieces 5-9 inches Premium Quality Realistic Dinosaur Figures with Hand Painted Vibrant Colors. 4 Pieces Rock and Dinosaur Egg Props. Endless Fun. 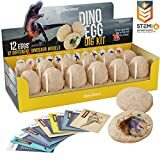 This Dinosaur Action Figure Toy Set Serves Perfectly as Educational Toys Encouraging Imagination and Creative Thinking. Jaws, Neck, Joints and Tails are Moveable. Children Make Stories with the Moveable Parts and the Rock and Egg Props Included. Premium Quality. Hand Painted with Full Details. Made with Durable Non-Toxic BPA-Free Vinyl. Toy Set Certified Conforms to US TOY Safety Standards ASTM F963. Large Sizes. Average Size 6 Inch. T-rex is Over 9 Inches Long. Dinosaurs Size from Minimum 5 Inches to Maximum 9 Inches to Build a More Realistic Jurassic Dinosaur Park. Perfect as stocking stuffers, party favors, birthday party games, educational purposes, party decoration, party favors, handouts or rewards. Ideal party favor or gift for a dinosaur themed birthday party.